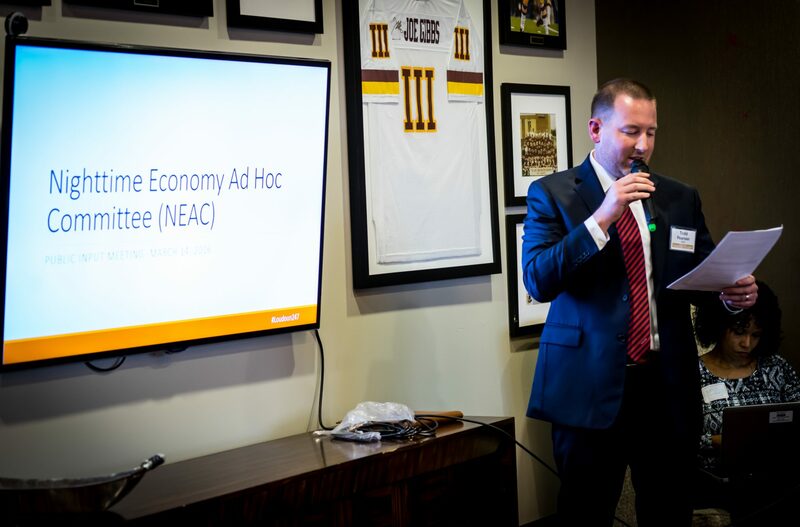 EDAC’s Todd Pearson speaking at the Nighttime Economy Ad-Hoc Committee’s public information session (Credit: Jay Tamangan). Loudoun County is seeking candidates to serve on the Economic Development Advisory Commission, a group of leaders charged with advising the Board of Supervisors on items impacting the business environment. Members of the Loudoun business community who are interested in volunteering their time and expertise to promote the economic growth of the county should submit an application online no later than Friday, August 17, 2018. In particular, EDAC is seeking applicants with experience and expertise in the following industries: education and workforce; national security and defense; retail; cyber security and small business. “The commission has proven to be an effective and important forum for discussion on topics that impact Loudoun’s future. They have provided important insight on workforce, a healthy continuum of housing options, the nighttime economy and many other matters that have helped us create a strong and diverse local economy,” said Loudoun Economic Development’s Executive Director Buddy Rizer. The commission meets six times per year, every other month starting in January. The meetings are free and open to the public; interested parties can attend the next meeting on September 7 at 8:15 a.m. in Ashburn. The commission’s members, bylaws, agendas and other documents are available at biz.loudoun.gov.